The A Kiss For The Petals series, known as Sono Hanabira ni Kuchizuke o in Japanese, is a long-running series of yuri visual novels developed initially by doujin creator group Fuguriya, later taken up by the group’s commercial brand Yurin Yurin for larger commercial releases in the series. As one might expect from a series initially created by a doujin group, the majority of the over 20 games in the series are very short, focusing on a single event with a single pair of characters. However, there are currently three larger releases featuring multiple pairs. The most recent of these was released in English as A Kiss For The Petals: The New Generation! by MangaGamer back in 2016. A Kiss For The Petals: Maidens of Michael is the first of these such games, first released in 2012. (The other longer game, Shirayuki no Kishi from 2013, hasn’t been released in English yet.) 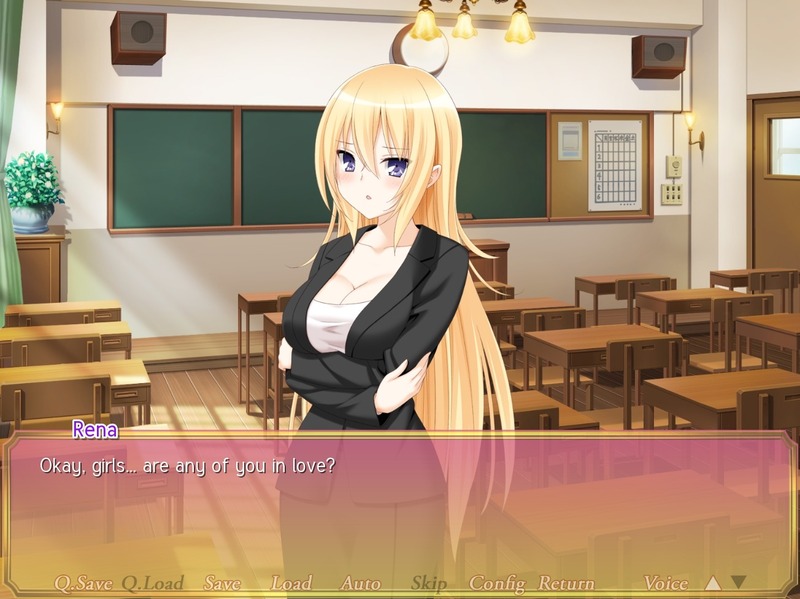 It stars all five pairs for the previous games, as well as the first introduction of Risa Azumi and Miya Ayase, also featured in A Kiss For The Petals: Remembering How They Met. I’m a yuri fan myself, but my experience is more with manga, and this is one of the first yuri visual novels I’ve read. While Risa and Miya are the primary focus of Maidens of Michael, after completing their story you can see the stories for the other five couples: Nanami Oda and Yuuna Matsubara, Sara and Kaede Kitajima, Mai Sawaguchi and Reo Kawamura, Shizuku Kirishima and Eris Shitogi, and Takako Suminoe and Runa Houraisen. They’re all students at St. Michael Girls’ School, with the exception of Takako and Runa, who are a respectively a teacher and student at St. Michael’s middle school annex. The students at the school vote the aforementioned couples in a “St. Michael’s Best Couples” event, particularly shocking Risa since she thought she and Miya were constantly arguing and butting heads. The couples end up comprising the Events Planning Committee, and the story follows them as they put together the school’s Christmas, Valentine’s and graduation festivals, while Risa and Miya discover their real feelings for each other. Yeah, this is a normal question for a teacher to be asking her students. Something somewhat awkward about Maidens of Michael is that, with the exception of Risa and Miya, all the previous couples had been introduced in earlier games which have never been officially translated. While the previous games are not necessarily required reading to understand the story – I was able to get through it pretty easily – the game does seem to assume a certain degree of prior familiarity with the characters, although there’s not a huge amount of story to be caught up on to begin with. If there’s any important information or backstory for a couple aside from “these two girls are dating” it’s generally provided, and if this game is any indication there’s likely not a ton of depth to the previous stories anyway. I’m not sure if I’d exactly call it an issue that I have with the game, but the nature of the story is something that definitely stood out to me. With the exception of Risa and Miya, the stories in general seem very inconsequential, like they’re a lot of momentary drama but lack any lasting significance. There’s plenty of cute yuri to be had here, both romance and H-scenes, but I personally wish the stories felt like they carried more lasting weight, while most of the drama seems to come from simple misunderstandings and lack of communication. There’s not much that I think will stay with me having finished the game, or that really stood out as exceptional. I wish I got to see more of this face. 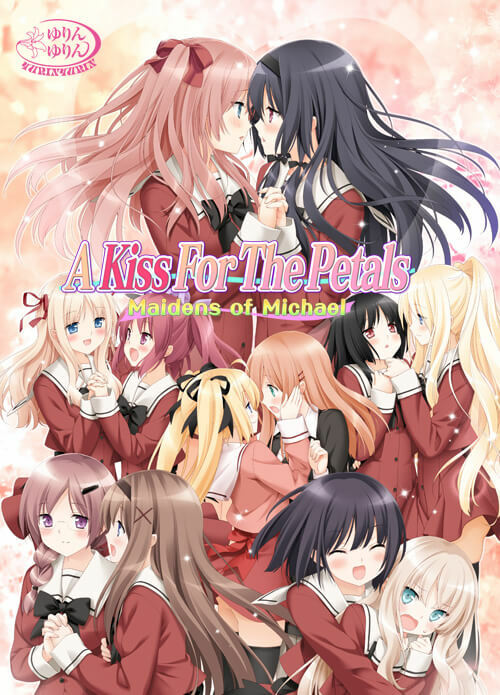 It seems like it would be rather a unique problem with the A Kiss For The Petals series, and with Maidens of Michael being one of the only games to have received an official English release. Risa and Miya are the only couple that receives any significant degree of development, since this is their first appearance and it goes through a full romantic arc for them. Meanwhile that same development and romantic arc are implied to have already happened for the other couples in the earlier games. As a result, there’s not much development in these couples to be seen, with the routes centered around seemingly somewhat isolated events. However, even if Maidens of Michael‘s drama feels somewhat inconsequential and the characters don’t get much development, that doesn’t mean they aren’t appealing. Since the majority of the story revolves around events involving the five main student couples, there’s a lot of interactions between them, which are enjoyable to see even if most of them don’t receive the full introductions from their earlier games. It’s fun to see the interactions between the couples, and it provides more than adequate introduction to everyone before you read their individual routes. The individual routes show these friendships as well, with the girls often helping each other get through the issues and misunderstandings that come up in their relationships. Even if the problems seem to lack significance, it’s still heartwarming to see them resolved, as they reaffirm and strengthen their relationships even if things aren’t always perfect. Choices like this come up from time to time, but it’s usually pretty obvious what’s the right choice. As for the H-scenes, Maidens of Michael has good number of them for each couple. That being said, they’re all pretty vanilla, and after doing 6 routes the H-scenes all tend to feel somewhat the same and blur together. Aside from the different pairs themselves and their own unique dynamics, most of them feel somewhat bland, especially the several times when it seems like there’s very little transition from regular scene into an H-scene. All that being said, if you’re mainly here for the yuri, as many playing the game likely will be, you’ll probably be satisfied. However, for me, even as a yuri fan, the H-scenes started to lose their shine after seeing enough of them across the six routes. The music is inoffensive, but it feels generic and uninteresting. None of it is particularly memorable, but it’s not intrusive and generally makes decent background music. The vocal opening and credits themes are fine, but nothing fantastic. I have a hard time commenting on the voice acting, considering I don’t speak Japanese, but it seems as good as any, although none of the voices particularly stood out. Rena is a teacher who’s known for very normal interactions with her students. Ultimately, I feel like I probably would’ve enjoyed Maidens of Michael more if I had played the previous games in the series. I’ve played Remembering How We Met, so I was at least somewhat familiar with Risa and Miya, but considering they’re introduced in this game that’s not especially important here. All of the previous games have been fan translated, so it’s possible to play them, if you’re willing to track down the games and patches. The characters are appealing as it is, and important story points are summarized in the game, but I think that the stories in particular would’ve resonated more with me if I’d played the other games. That being said, it’s still not a bad introduction to the characters and the A Kiss For The Petals series as a whole, and even if they seem somewhat inconsequential the stories are still enjoyable and heartwarming to read. With its multiple routes it’s longer than most of the other games in the series, similar to The New Generation! – I don’t know exactly how long my playthrough took, but VNDB lists it in the 10-30 hour length category. While it’s definitely not the best yuri I’ve ever read, it’s decent for $34.99 USD. It will be even better if we get the earlier games officially translated at some point, but as it stands A Kiss For The Petals: Maidens of Michael is still not a bad choice for yuri fans.